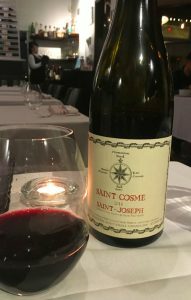 2016 Saint-Cosme, Saint-Joseph Rouge, Northern Rhone, France. Louis Barruol’s negociant Saint-Joseph Rouge comes from, as he puts it, one of the most underrated areas of the Rhone Valley, being a great area with steep slopes and ancient granite soils making for usually perfumed and tension filled wines of elegance and vitality. The exceptional vintage 2016, which as per normal is from old 100% Serine clone (ancient local variety of Syrah) and Barruol employed 30% whole cluster fermentation to add complexity and a dynamic quality that can sometime be missing from non-estate grown versions. The wine was aged twelve months in oak with it being 20% in new casks, 40% in casks used once and 40% in casks used for two or three times prior, which is more or less what was used for his medium level AOC wines, like his Crozes-Hermitage and basic Gigondas. Where as the Crozes-Hermitage was, at this point at least, much more perfumed and racy with a powerful sense of violets, this 2016 Saint-Joseph is more meaty and shows an earthier character, less floral in it’s youth and richer on the palate with layers of blackberry. plum, boysenberry, currant and kirsch fruit along with a hint of leather, tobacco and camphor, as well as a delicate spicy edge that should become more pronounced with age as the baby fat settles and the stems raise the aromatics. Tight and dense, things look to refine and it should reveal a more elegant character with age, best to give this one a few years more before opening. Still, that said, it is hard to find a better bottle of Saint-Joseph for the price than this, even now, so I’d stock up on this one, and if you missed it, don’t panic as rumors have it the 2017 is just as good and is coming out soon. 2017 Hundred Suns, Pinot Noir, Old Eight Cut, Willamette Valley, Oregon. 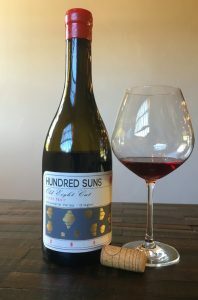 Hundred Suns Wines, a reference to the growing season that lasts a hundred days between flowering and harvest, is one of the best finds in Oregon and produce a thrilling set of Willamette Valley Pinots, including this brilliant Old Eight Cut 2017, from a vintage that winemaker across the region are over the moon with. The Hundred Suns label is the personal winery of ex-Beaux Freres man Grant Coulter and Renée Saint-Amour who was on the team at the Carlton Winemakers Studio, these two are crafting some amazing stuff, and I loved their 2016 version of this Old Eight Cut, so it was great to just get my latest couple of wines from Grant, who’s also from Monterey, my hometown, and Renée, which included their top wine from the Sequitur Vineyard and this Old Eight Cut that is a barrel selection from a combination of vineyards from the Willamette Valley including the renowned Shea Vineyard in the Carlton-Yamhill County. They employ a minimalistic approach to their winemaking at Hundred Suns and with a gentle hand, they fermented the 2017 Old Eight Cut using about 30% whole cluster with native yeasts, aged on gross lees for 11 months, in mostly used French oak, then it was gently racked to tank and gravity fed into bottle. This pretty ruby/garnet hued 2017 is full of purity and is very expressive, Grant was excited for me to try it and I can see why, it’s a gorgeous and lively Pinot Noir that has a youthful, almost semi carbonic, fruit intensity, showing waxy blue fruits, spice, earth, a hint of dark walnut as well as an exciting burst of fresh acidity, adding a polished core of cherry, plum and tart black currants. With air things get more traditional and a subtle floral perfume comes through and a touch of stems, with a herbal/tea note helping cut the fruit impact on the medium bodied palate, but overall the texture is satiny and refined in this wonderful Pinot Noir. 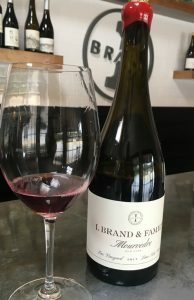 This Hundred Suns Old Eight Cut 2017 has a unique personality, it feels like a Foillard Morgon Cote de Py first out of the bottle, then slowly and steadily gains a more Pinot like profile, people familiar with Philippe Pacalet’s Burgundies will definitely see a familiar transformation in the glass. Grant and Renée add, that this Willamette Valley cellar selection stitches together pieces from each of our single vineyards into a focused blend of each unique and divergent site, as well as highlighting the 2017 vintage, which started cool then gained steam for a classic Oregon finish, making for fresher and more vibrant wines than 2015 and 2016. Along with Shea, in Yamhill Carlton, which is a single clone 777 block on the sedimentary soils that cover a deep layer sandstone, they also sourced from Mike Etzel’s Ribbon Ridge Sequitur Vineyard, which might be the most prized site in the Valley these days, with its biodynamic farmed mix of Chalone, 943 and Pommard clones on classic Willakenzie series soils (Marine Sediment) as well as the Coast Range site, Bednarik Vineyard that is all Pommard clone, and again on the Marine Sedimentary soils. This combo gives this wine its complexity and intriguing personality, with this vintage showing the cooler vintage to perfection with more precision and tight detailing on display here. I can’t wait to see how this wine ages, it is fun and playful now, but it has a ton of potential for the future, I’m hooked on these wines, and this one is a great value. 2017 Weingut Carl Loewen, Riesling Trocken, Maximin Klosterlay, Mosel Germany. The Maximin Klosterlay, a Erste Lage site, from the village of Detzem, where is gorgeous Riesling hails from, was the first site acquired by the Loewen Family in 1805, with the estate now currently run by Christopher Loewen, who is one of German’s hottest winemaking talents, and his father Karl-Josef. As Loewen’s American importer, Terry Theise notes, in the late 1980s and 1990s, Karl-Josef was always looking for old vineyards and grew the Loewen by purchasing steep old vineyards that were very low yielding and intense site that no one wanted to work anymore. Now the holdings are spread over 4 villages that include Leiwen, Longuich, Detzem and Thörnich, with over 50% of the holdings being ungrafted, original clone, very old vines that range from 60-120 years old and as mentioned on ultra steep slopes. Loewen is practicing organic farming and Christopher is crafting highly detailed wines in the cellar with ferments are completely natural without any addition of enzymes or nutrition, Loewen whole cluster presses, but the pomace is never moved. Loewen notes “when you move the solids, you break stems, which leads to phenolic (bitter) flavors”. So the juice is “browned” or oxidized pre-fermentation and the single vineyard wines, which are block picked and go directly into Fuder barrels (around 1000L) which average 25 years old, where they are fermented with native yeasts and aged. This Maximin Klosterlay is made from 45 year-old vines in the central part of the vineyard and was fermented all the way to 11 g/l of residual sugar, and 12% natural alcohol. Christopher’s wines are never inoculated and without temperature control being used or needed, because the cellar temperature is only about 11 C degrees. The premier cru Maximin Klosterlay, which is all grey slate terroir driven, has made for some outrageously stunning Kabinett(s), but now with Christopher at the helm is Trocken, and this 2017 is so good, you’d be forgiven for not thinking you were drinking a top GG, such is the presence in the glass here, this is serious stuff. The nose starts with that slate smoky intensity before allowing rosewater and chamomile to show that leads to a layered, but crunchy mineral laced palate with salty stones, ginger spice and lovely range of yellow fruits, with apple, apricot, lime, kiwi and quinces. This is brisk and powerful Riesling with plenty of pure extract, ripe golden hues, flavors and vivid acidity, this is a wine that will appeal to Riesling freaks, like me, but also those that love flinty wines, like Premier Cru Chablis and or Cru Sancerre as well. Air brings out texture and adds some peach, cheesy/leesy notes and earthy tones, making for a wine of stylish complexity and a remarkable value for the price, this Riesling is sleeper in Loewen’s latest set of awesomeness, and while I love his Herrenberg 1896 wines, coming from German’s oldest Riesling ungrafted vines, this Klosterlay Trocken is exceptional. Weingut Carl Loewen is a tiny winery, but these latest vintages, 2014, 2015, 2016 and this 2017 are some of my favorite wines, and Riesling guru and famous importer Terry Theise put them as winery of the vintage for their 2017 collection, adding, Carl Loewen is the estate with whom he was most profoundly impressed. They not only ascended to a hitherto undreamt-of level of quality, they seemed to have the Midas-touch, as wine-after-wine-after-wine was almost eerily perfect, gorgeously balanced, and poised not with any great assertiveness but instead with a serene gentle perfect-pitch of the purest harmony. 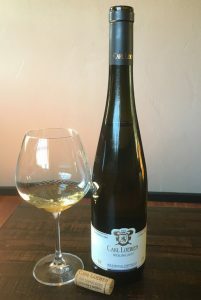 For him, the Loewen wines, along with Donnhoff and Selbach-Oster are must haves, and I totally agree, especially this Maximin Klosterlay Trocken, the price is stupid low for the quality and class you get, drink over the next 5 to 10 years. 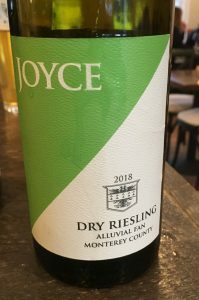 2018 Joyce Wine Company, Dry Riesling “Alluvial Fan” Monterey County. 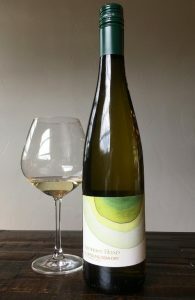 The lovely and bright new Alluvial Fan Dry Riesling from Joyce Wine Company is more flamboyant in fruit and mouth feel than the previous vintage with this 2018 adding a bit more of a textural element and has a slight touch of residual sugar, making more like a modern Feinherb, but still technically dry and crunchy. This was done on purpose as the last vintage came across a touch too severe and Joyce wanted a little less zip and more class (balance) on the palate. Russell Joyce, winemaker, who is a big Riesling geek himself admires the wines of Gunter Kuntsler from the Rheingau, and Schlossgut Diel’s Caroline Diel from the Nahe, among others, wanted to make his Riesling standout and be exciting in the glass. This new vintage certainly feels more expressive and exotic on the palate, he chose to ferment in stainless steel to preserve ultra fresh detail, but he also aged some in neutral cask along with some in stainless barrels to build some mouth feel and make this high acid wine more generous in nature, all which was successful in the final makeup here, much the same way he was with his Albarino in this vintage. Again while technically dry in style, much less sweet than a Kabinett, the tiny bit of sugar allows for this Riesling to have that hint of creaminess you can find in Alsace examples. The profile here, has real Riesling core, and while retaining some of the bitter citrus, green melon and unripe (green) apple of the 2017 adds a whole new level of complexity and dimension with layers of kiwi, peach, tropical fruits (passionfruit/papaya) and key lime fruit along with wet stone, chalk and racy herbs. I look forward to following this 2018 Alluvial Fan Dry Riesling over the next 6 months to a year in bottle too see how it develops, but I love the way it tastes now, it will be a fun food wine, especially with spicy shrimp dishes, sushi as well as cheeses and cured meats. Joyce who is more known for his line of Monterey County Pinot Noir(s) as well as his Tondre Grapefield Syrah and Carmel Valley estate grown Bordeaux varietals (Cabernet Sauvignon and Petrus Clone Merlot) has a good touch with his whites, you should not miss his Old Vine Chenin Blanc, his Escolle Vineyard Santa Lucia Highlands Chardonnay, the mentioned Albarino and this Dry Riesling, they are all tasty efforts that are real quality wines that deliver much more than is expected, especially these 2018’s, which is one of the best vintages locally (Monterey and Central Coast) I’ve ever seen. This 2018 is available by request now and will be publicly released on March 24, 2019, don’t miss it. 2017 Domaine de L’Ecu, Muse, Rosé of Cabernet Sauvignon, Vin de France, Loire Valley, France. Fred Niger’s Domaine de L’Ecu, one of Muscadet’s top estates, Rosé “Muse” is a unique Loire pink made from all organic Cabernet Sauvignon that is 50% Saignee and 50% direct whole cluster pressed and aged in tank, making for a crisply dry Rosé, but with a more ripe profile and complexity of flavors from this cool Atlantic influenced terroir. While L’Ecu crafts traditional Melon de Bourgogne Muscadet’s, Niger is a committed Natural Wine producer, as his importer puts it, most notably, he pushes the envelope beyond traditional Muscadet and Melon de Bourgogne with his stunning non AOC line of VDF wines, impressive not in the least because they have no added sulfur and yet ring with a purity, vibrancy and clarity that defies what one thinks is possible with natural wines. The Domaine de L’Ecu estate, certified biodynamic by Demeter in 1998, is one of France’s most innovative wineries and Fred Niger, who trained with the estate long time and pioneering previous owner, Guy Bossard, who made single terroir wines based on soil types and who like Nicholas Joly took his partnership with nature very seriously and spiritually, with Fred continuing it after taking over in 2012, produces Muscadets that have remarkable depth, precision, as well as ageability. Beyond Muscadet, Niger makes a wide range of thrilling stuff including amphora raised Cabernet Franc, Pinot Noir, Melon & Gamay and other things, as well as a fine sparkler, a rare Folle Blanche and of course this fun Rosé. 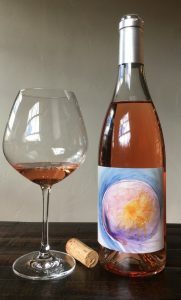 The 2017 Muse Rosé is dusty dry and eye poppingly zippy, but has lots of flavor with ripe details and tangy intensity showing vibrant sour cherries, watermelon, strawberry and grapefruit like citrusy notes adding mineral, wet stone, saline and herbal essences. The nose opens up and gives hints of rosewater and orange marmalade and the finish here is briskly tart and refreshing, allowing this Rosé to go with a lot of food options and it should age well too, it imagine. This is one of my favorite L’Ecu wines not a traditional white along with their amazing and beautiful whole cluster, amphora raised Pinot Noir “Ange” which is absolutely outrageous and maybe my favorite “Natural Wine” to date! 2016 Weingut Willi Schaefer, Riesling Kabinett, Graacher Himmelreich, Mosel Germany. 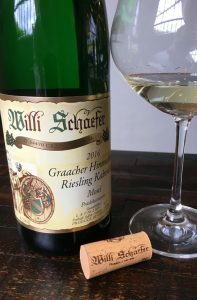 After a wet and cold spring and early summer 2016 turned out to be a kind of a miracle vintage in most of Germany, and Schaefer’s Graacher Himmelreich Kabinett is a gorgeous wine that truly captures that miracle in the bottle! 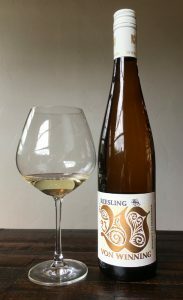 This beautifully balanced and traditional off dry Mosel Riesling delivers a classic performance in the glass with bright fruit detail, smoky/flinty/stony notes and a perfect play between the sugar and acidity. While I love the drier styles now available from the Mosel, like Carl Loewen’s recent vintages, Grunhaus, Knebel and the Loosen GG’s it is impossible not to love the traditionalists like Selbach-Oster, Markus Molitor, J.J. Prum and these awesome Willi Schaefer offerings. One of the most iconic producers in the world, Weingut Willi Schaefer, now made by Willi’s son Christoph, is one of the very top producers in the Mosel, if you want high quality traditional Riesling this is the estate to search out, and it is hard to imagine a better introduction to German Riesling than their Graacher Himmelreich Kabinett, it’s terroir expression and purity is legendary! This wineries vineyards all lie in the Mosel’s Wehlener Sonnenuhr and Graach with the wines coming off either of the Graach zones Domprobst and Himmelreich crus are set on the steep slopes of Devonian slate, which gives these wines their crystalline transparency, intensity and mineral focused character. As mentioned, these are handcrafted old school Rieslings that are informed by their must weight and gracefulness of their residual sugars that give these wines their textures, while still having structural acidity and freshness, these are wines that drink well from day one, but are made to age decades. The 2016 Graacher Himmelreich Kabinett is full of fruit with crisp green apple, tangy apricot, key lime and a touch of tangerine sorbet that is balanced by the saline infused wet shale, spicy dried ginger, verbena and mineral tones. Air allows a perfume of white flowers/citrus blossom and rosewater to come through and while steely, it gains a creamy moth feel that makes a significant impact on the palate, this is a lovely vintage for Schaefer and this Riesling is perfect for low alcohol cuisine, like Thai, spicy Chinese, Indian and with smoked or cured meats. At only 7.5% natural alcohol this Graacher Himmelreich Kabinett is easy to sip and quaff, but is a serious wine that deserves your full attention, it has a generous nature and is seductively complex without being fussy, drink this fabulous Riesling for the next 10 to 15 years. As these wines are hard to find, you’ll need to work hard to get this, but happily I hear the just released 2017 is even better, and I’m getting a few soon! 2017 I. Brand & Family Winery, Old Vine Mourvèdre, Enz Vineyard, Lime Kiln Valley, San Benito County. Fast becoming a cult like and followed wine, the Ian Brand made Enz Vineyard Old Vine Mourvèdre is a new California classic with dark and earthy flavors, firm tannic grip and layers of black and red fruit, spice and mineral tones. Ian is very involved in the farming here and has developed a strong bond with these gnarly and historic vines, crafting a wine from here that is singular and unique. This 2017 is highly enjoyable, even being so young, carried by perfectly ripe fruit that is lifted by natural acidity and structural tannin, it shows blackberry, wild plum, mulberry and baked cherry fruit on the medium/full palate as well as hints of stemmy elements, sage, basil and anise along with a faint trace of violets, warm stone, incense and lavender. To capture this unique sites true character, Ian fermented his Mourvèdre with native yeasts, using 50% whole cluster, very traditionally in a concrete tank, and he lees aged it in a combination of French barrels, only 20% new, and one large puncheon, for a total of 11 months. Brand believes his grapes come from the best block on the vineyard, and he considers it among the best, if not the best, Mourvèdre plantings on the continent! The Enz Vineyard in the Lime Kiln AVA of San Benito County was planted in 1922 on a north facing 5-10 degree slope, set on calcareous and granitic loam soils gets warm/hot days and cool nights that make for top notch Mourvedre, a grape that was originally from Spain, but maybe best known in France’s Provence as in the great wines of Bandol, like those of Domaine Tempier as well as in Chateauneuf-du-Pape where it is found in some elite wines like Beaucastel and Vieux Telegraph. Brand notes, the vineyard was originally planted to support a hotel around a vigorous lime kiln business in the late 1800s, but had become very little known since WWII, as this region was never a wine hotspot. The Enz Mourvèdre budwood was sourced from the original 1860s planting(s) in the Lime Kiln Valley, supposedly brought over by a vigneron when he emigrated from France. These vines, according to Ian, are thought to represent a distinctly different genetic clone than that other Mourvèdre found within the state. Mourvèdre, especially made from old vines, is one of California’s great values and a special treat for powerful and age worthy reds and there are some amazing wines out there made from this grape, which is known as Monastrell in it’s birth place country of Spain and was nicknamed Mataro here in California early in the last century. If you are looking to explore this grape, I suggest you peach out Ridge Vineyards, Dirty & Rowdy, Bonny Doon’s Old Telegram, Sandlands, Tablas Creek as well as Ian Brand’s awesome Enz Vineyard version, it’s a wine that delivers an exceptional performance without grandiose pretense, and this 2017 while generous in its youth it should really get better over time, be sure to hide a few bottles (in the cellar) for 5 to 10 years for exciting rewards. 2016 Saint Cosme, Cote-Rotie, Northern Rhone, France. 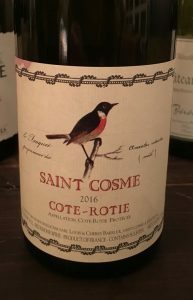 The gorgeous and stylish Saint-Cosme 2016 Cote-Rotie is a luxurious vintage and opulent version with a textural grace and inner force that reminds you this is a wine that needs to be taken seriously. Barruol is a huge fan of the ancient local clone of Syrah and his Cote-Rotie is 100% Serine (Syrah) grown on pure Schist in the Le Plomb, Besset, la Viaillère and Neve Lieu-Dit vineyards. This vintage is spectular for the Northern Rhone, especially Cote-Rotie offering both ripe flavors and lifting acidity, these are powerful and dense wines, but with excellent balance, finesse and length. Saint-Cosme’s spent twelve months aging, with 40% in new casks and the remaining 60% in casks used one time which seems pretty lavish at first, but when the wine opens it all folds together to near perfection. Helping absorb the new oak is the vintage’s fullness and nice acidity with Barruol using 100% whole cluster fermentation, which is why this wine excites the palate and has intriguing complexity and a background of savory spices to go with that thick black and blue fruit. This 2016 Louis Barruol Saint Cosme Cote-Rotie has everything you’d expect and want, especially for the price this is outrageously good stuff, maybe a sleeper in a vintage full of great wines from the region, but one that should not be missed, and a wine that will only get better with time. While known for his famed Gigondas in the Southern Rhone, Barruol has a gift for these Northern Rhone Syrah based wines and this Cote-Rotie is prove positive of that remarkable talent with it showing classic detail, restraint and heavenly length in a medium bodied beauty that is full of black fruit, spice, cured meat and toasty oak notes, like a baby Guigal La La. Layers of boysenberry, damson plum, black cherry and blueberry fruit forms a core here along with a touch of graphite, creme de cassis, peppercorns, elegant violets, mineral tones, vanilla and anise, that all come together in a seamless and magnificent symphony of flavors. Things should get even better and more interesting over the next 5 to 10 years, even better is news that in case you missed this 2016 the 2017 looks to be as good if not even better, if you’ve not discovered Saint Cosme’s negociant wines, now is the perfect time, especially his Crozes-Hermitage, Saint-Joseph and Cote-Rotie bottlings.